The New Versus Resales Gap: Which Way Will It Go in 2019? 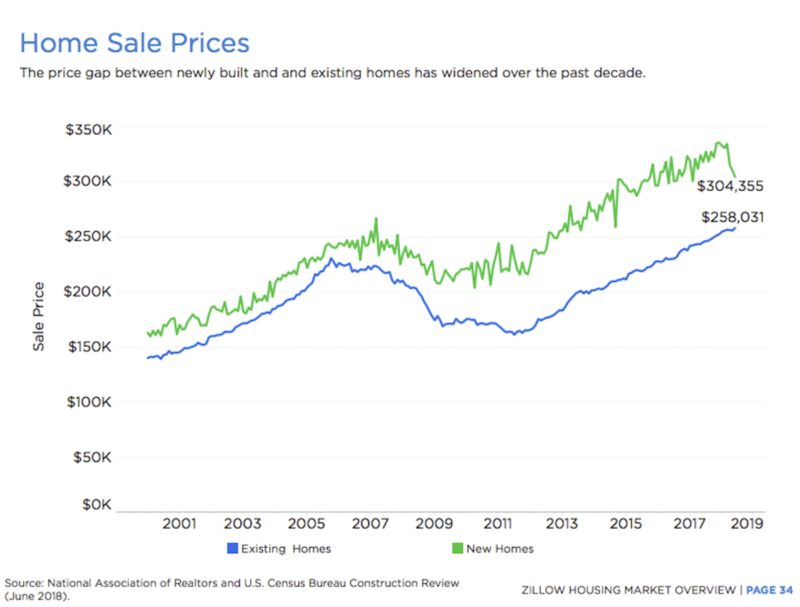 Throughout the late, great, housing recovery, starting in about 2012, the relationship between sales of existing homes and new home sales was expected by many experts to revert to historical norms. That’s what longstanding economic trends tend to do, how they typically behave. One of housing’s cannier numbers experts, Bill McBride, author of Calculated Risk, has predicted, from the earliest sparks of sustainable momentum on the new residential construction front through the sputtering, hiccuping, misfiring past six months or so, that the gap separating resales unit volumes from new home sales would narrow. Historically–or since 1994 or so, anyway–a new home sold for every 6 existing home sales. That relationship collapsed during the foreclosure crisis of the Great Recession, when new home sales fell off the table in 2008 through 2011, and existing home sales reflected massive bulk buying of distressed residential properties. McBride’s observation, here, aligns with a widely held view. The gap has persisted even though distressed sales are down significantly, since new home builders focused on more expensive homes. That’s a sore point for many home builders. Well, home builders are businesses. They buy land, labor, materials, designs, construction processes, and permits, and they sell people homes and communities. During the entirety of this recovery, builders bought land high, they paid more and more for scarcer skilled labor, and they endured a spike in materials and products prices as both demand and trade disputes pressured prices. And throughout almost the entirety of recovery, housing finance rules and practices hugely favored wealthier, higher earning, freer-of-debt, and more established buyers over the ones who had less “skin” to put in the game in one way or another. To conclude that “builders focused on more expensive homes” suggests that builders chose not to meet a vast unmet need, the wage-earners of households in the median income ranges. However, what is the case is that the vast unmet need–among those lower-earning households who’ve typically represented a good risk for housing lenders, a good, healthy flow of young neighbors in residential communities, and a critical stream of essential workers for local economies–still exists. Because the gap never closed. Let’s take a brief moment and unpack that gap, however, not from the standpoint of the difference in unit volume between resales and new home sales. Rather, let’s look at price. , the gap was about $46,000, or 18%.That price differential, whether you’re looking at median prices or average selling prices, where the differential is closer to 28%, is a big point of focus for home builders right now. As they look at the challenges of 2019 and beyond, they see a perhaps empowered path through uncertainty by bringing down selling prices, accepting lower gross margins, accelerating incentives, pushing pace of absorptions, and … catching their breath when–hopefully–after a quarter or two, demand fundamentals kick back in. During the past several years–in many important respects–new competed with new. Mostly discretionary buyers could choose–communities, interior finishes and tech packages, outdoor living features, etc.–among a set of new home options. Now, in real, down to earth, life-or-death ways, new competes with resales. It means operational infrastructure, land and finished lot access, working and investment capital streams, construction workflows, selling systems, value-driven designs, and community counts need to go toe-to-toe to pry open the still-largely quiescent “starter home” market. Part of that–and we’re so energized to see how builders will react and respond to the dizzying wave of constraint and lost momentum–will be to lower the barriers that impede younger, less established, more “risky” working households from their shot at attaining and paying for The Dream. Equally important, we feel, is a challenge and opportunity that binds new home builders together with a united purpose. That is, to raise potential buyers’ desire and preference for new versus resale. To heighten the value of new. In 1970 there were no codes or standards for energy efficiency, and the resiliency requirements motivated by the experiences with Hurricane Andrew in 1992 and the Northridge earthquake in 1994 were still years off. Many code changes targeting fire safety (such as requirements for smoke alarms, fire separation, fire blocking, draft stopping, emergency escape openings, electrical circuit breakers, and capacity and outlet separation) were also implemented after 1970. In short, in just about every way imaginable, new homes are being built to higher standards than they were in 1970. So if you want to improve the built environment, one of the first things you need to do is figure out simply how to increase the production of new homes, built to modern standards, so it becomes possible to retire more of the older ones. We have to stop blaming builders for the gaps in volume and price between new homes and existing homes. We have to start lowering the barriers–as builders who are pressing volumes, compressing per-unit gross margins, and banking on almost flawless execution and deep local scale are doing–that impede first-time home buyers from choosing new homes. And we, as members of the new home business community, need to focus home buying customers, municipal decision-makers, and housing finance players, on the difference that a new home, and a new home community make. New is better–for pocketbooks, for the environment, for safety, for health, and for comfort–than used. That’s the reason for some of the gap. The rest of the gap that separates new home sales volume and pricing from existing home benchmarks stands as somebody’s big, big opportunity.